Appliqué, the process of sewing one fabric over another surface, lends itself to some dazzling quilts. Through appliqué, you can achieve delicate shape — particularly curves, flowers and organic lines — that would be impossible to re-create through patchwork alone. 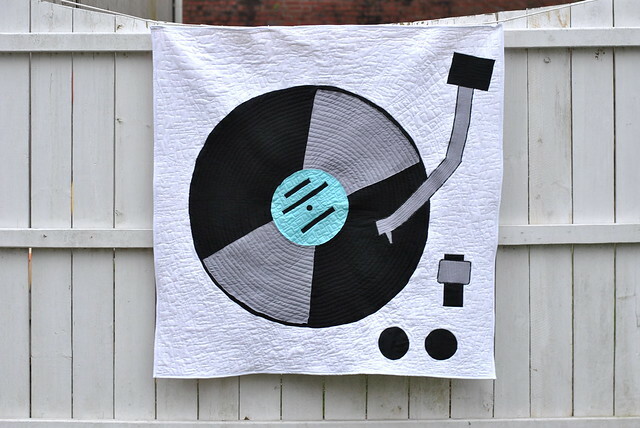 For instance, I used appliqué to design a turntable quilt for my husband. The large appliqué pieces were fused to the fabric with spray basting pins, and then machine stitched using raw-edge appliqué. You can read more about this design at my blog Lindsay Sews. If you admire appliqué quilting projects but don’t know where to start, we’ve rounded up some great designs to inspire you. You can sew them by hand with needle-turn or finish a bit quicker with machine-stitched appliqué. As you can see, the design possibilities range from traditional to whimsical and cutesy to modern. The free Double Dresden Delight pattern by Happy Quilting offers a modern take on the traditional Dresden Plate quilt block. Now that both the insides and outsides of the ring are pointed, this appliqué quilting design takes on a fresh new look. Follow the pattern or arrange the blocks as you wish for a custom design. If you’d rather avoid pieced circles in your quilting, applique is the perfect alternative. The Circles! quilt pattern by beaquilter is a fun and simple appliqué quilting pattern made with large blocks. Each circle can be appliquéd by hand or by machine. If you’d like to assemble the quilt top first, you could always finish the quilting and attach the circles in one step. The Honey Bunny Appliqué quilt pattern by JoAnn Hoffman Designs is made using a fusible raw-edge appliqué technique, though she says it’s also suitable for needle-turned appliqué. This quilt will also help you perfect your bias binding as you finish those round edges of this fun appliqué quilting pattern. Make the quilt Easter-themed by replacing the carrots with Easter eggs, as suggested in the PDF pattern. The Orange Peel Quilt, blogged about at Told You Sew, was appliquéd by hand using freezer paper as a design tool. Each finished petal can then be stitched onto a base fabric and then the squares are pieced together. This appliqué quilting pattern would look great as a throw pillow or even a larger-size bed quilt. When one appliqué motif is repeated in each block, you can add interest by varying your fabric colors. The free “Puppy Love” baby quilt pattern by Craftsy member jmann would look so cute in a baby’s nursery. This pattern was designed with hand quilting in mind, although you could also adapt the design to use raw-edge machine appliqué. If you’re looking for a more hands-on approach to learning appliqué quilting, check out the class Machine-Finished Hand Appliqué with Beth Ferrier. What do you think about appliqué quilting? Do you prefer the look of needle-turn designs or machine-stitched appliqué? It is funny you would mention applique this week. I have to brag today. I made a quilt top this week in four days. And I put two appliques on it — one of Spiderman and one Batman. I am really excited, but I sure had a sore back the 5th day. I am excited to be getting quicker. My friend just sent me this post of an applique quilt that she thought might help me what my problem. I have 8 scrappy stars that I want wondering how to get them into a quilt and we thought doing applique might work and this seems to confirm that. Thanks! I love appliquing by hand.These patterns are beautiful.When I start to applique,I never want to put it down.